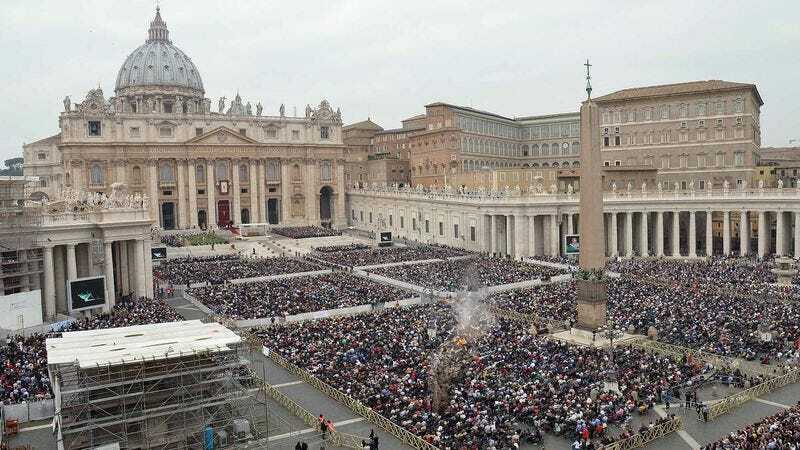 VATICAN CITY—After botching a high-speed aerial maneuver while flying at low altitude over St. Peter’s Square, an out-of-control angel reportedly slammed into the stands at this year’s Vatican Air Show, killing 38 spectators and injuring hundreds more Friday. “I could tell something was very wrong when he slowed down and pitched upward at the top of his loop-the-loop; angels just aren’t built to pull those kind of G’s,” said witness John Kelly, recalling how the divine messenger failed to counteract his aggressive starboard roll, rapidly corkscrewed downward, and struck the ground at full speed, pinwheeling into the crowd and leaving a grisly trail of destruction. “I think some people thought that his wing-over-wing tumbling was all part of the act, which is why they didn’t move out of the way. Unfortunately, by the time they realized he wasn’t just buzzing the crowd for a thrill, it was too late.” Citing an ongoing investigation, Vatican officials regretfully announced their decision to cancel the event’s signature cherub dogfight.